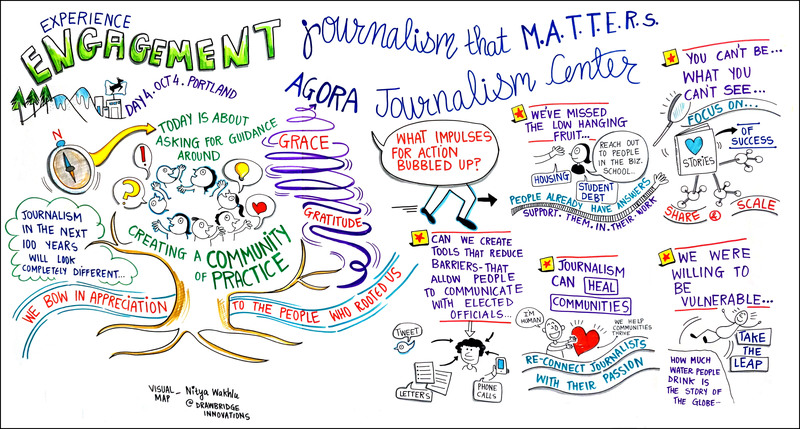 An 11-part series on the progress, promise and potential challenges of community engagement in journalism inspired by Experience Engagement. Produced by the SOJC Agora Journalism Center. Watch video highlights of interviews with Michelle Ferrier, Associate Dean at Scripps College of Communication, Ohio University, and Andrew Haeg, Founder & CEO of GroundSource. Our intent is to illuminate, inform, and support community information health that contributes to thriving, inclusive communities by learning about processes that grow it, creating products that support it, catalyzing a community of practice dedicated to it, and identifying actions to amplify it. Experiencing Engagement from SOJC Agora Journalism Center on Vimeo. Every activity during the conference models a practice that can be used for community engagement. Additionally, we’ll be employing an evaluation practice called Developmental Evaluation, which supports innovation, adaptation, and systems change. We see it as a promising approach to understand the impact of community engagement work. The conference was located in the UO’s George S. Turnbull Portland Center, located in the historic White Stag Block of the city’s Old Town.